Deal with chips and stratches on your atuomobile with confidence. Excellent results with a 3 step patented German touch up paint system. Your order will be processed based on the color/paint code for your vehicle's make and model to ensure exact match. Not only chips and scratches will disappear with this new technology, it will protect these spots from corrosion and rust when properly used per instructions. Your vehicle will look great. With the help of the patented clean up solution, you will be able to apply the paint without worrying about making mistakes. Fix the stone marks and scratches with the 3 step process in no time. Touch up paint has never been this easy! - 25 ml Touch up paint specific to your vehicle's color code. - 50 ml German patented cleaning solution. - 25 ml Carnabuba based polish. - 25 ml Advanced G3 liquid paste & Various touch up paint application materials. - 50 ml Touch up paint specific to your vehicle's color code. - 100 ml Touch up paint specific to your vehicle's color code. - 100 ml German patented cleaning solution. 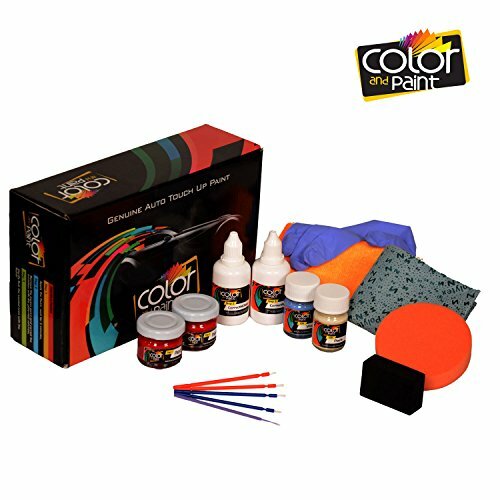 Color of the cloth and sponges included in the package will vary based on in stock availability. Products will be specific to customers, for that reason it will take at least 3 days to prepare and ship. No returns are accepted, as each package will be specific to you.